Summer is officially here! I can actually say I’m ok with that even though Vegas temperatures get into the 110’s this time of year. At least it’s not humid. It’s pleasant to be outside in the evening after the sun goes down and I’m pretty much at work all day until then. It’s freezing cold at my office, which makes getting into my furnace of a car more bearable. After making these pies yesterday I spent some time trying to acquire a taste for IPA beers. It’s still a work in progress, but I’m excited about it and Colby is thrilled that I’m finally trying more beers. I have more appreciation for the beer making process after reading about home brewing a bit. It’s pretty amazing that a drink made of just a few simple ingredients- barley, water, yeast, and hops- can have a huge flavor range. Each of the ingredients significantly and uniquely contributes to taste. I’m back to drinking wine today, though! Compared to the bitter IPA’s, wine tastes smoother than ever. Tonight’s summer wine is the Honey Moon viognier fresh out of the freezer. It’s more of a wine slushie and it’s a perfect patio wine: light, sweet, and fruity. Pick one up at Trader Joe’s for $5.99. You can even sip it with this recipe! 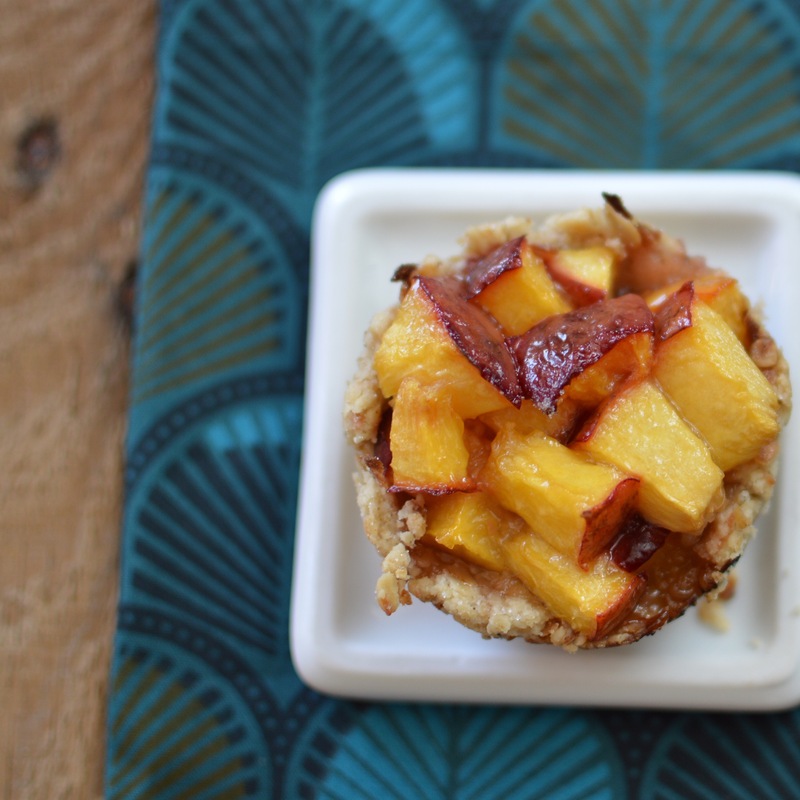 The Recipe Redux challenge for June is to create a healthier pie. My plan was to make rhubarb pie, but I didn’t feel like going out in the heat to pick up ingredients. Fortunately I had a few fragrant nectarines and limes in the house. Sometimes the best recipes happen by accident or when you don’t have everything you need on hand. These pies are healthier because they’re portion controlled and lower in sugar than traditional pie. 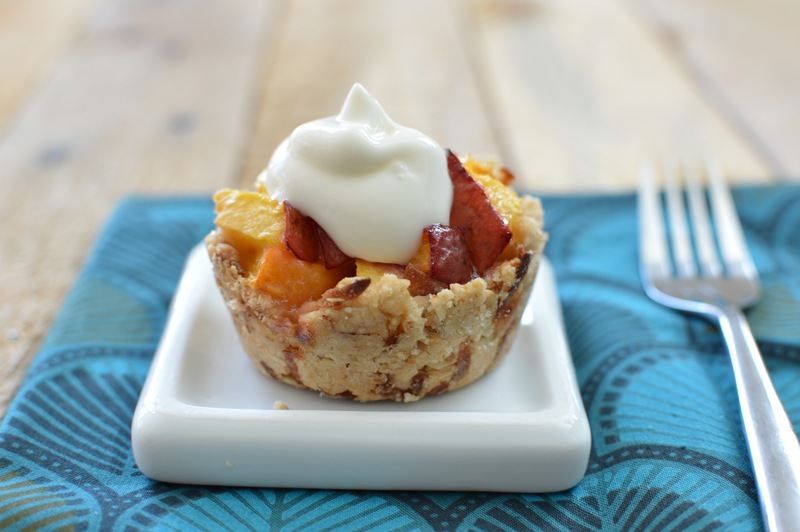 The crust is made with oats and coconut and the pies are topped with non-fat Greek yogurt in place of ice cream. Enjoy! 1. 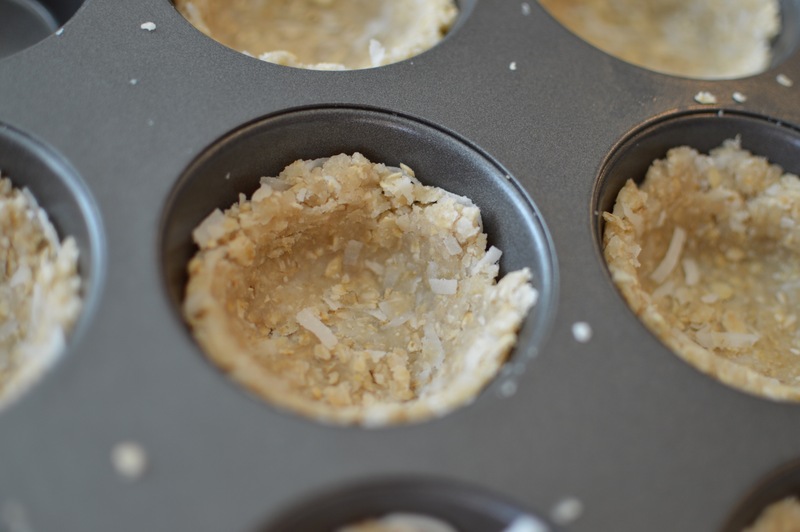 Preheat the oven to 425 degrees and lightly grease a muffin tin with cooking spray. 2. In a large bowl, combine all ingredients for the crust and mix until fully incorporated and a doughy ball forms. 3. Take about a golf ball sized chunk of the dough and press it into a muffin tin with your hands. Press it down and push it up the sides to spread it thin. (See picture below) Repeat using the rest of the dough to fill 8 muffin cups. 4. Bake the crust for 8-10 minutes until golden and fragrant. While the crust is baking, toss together nectarines, lime juice, sugar, cornstarch, salt, and cinnamon (if using) in a large bowl. 5. Allow the pie crusts to cool slightly before scooping in the filling. 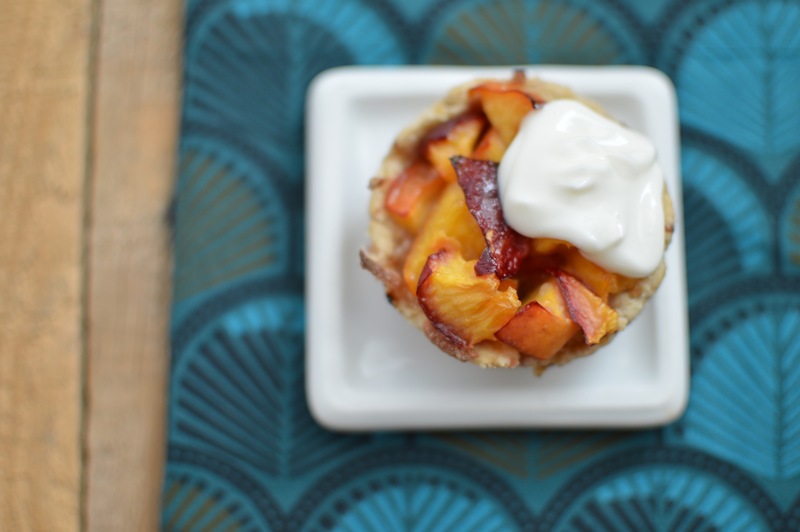 Use a spoon to scoop the nectarine filling evenly among the cups. Bake for another 15 minutes, or until the nectarine filling is bubbling. 6. Cool the pies in the tin until ready to serve. Remove from the tin gently using a butter knife. Just before serving, stir honey into greek yogurt and top each pie with a 1 oz dollop of the honey yogurt.